Sick of Spotify? Tired of Tidal? Annoyed by Apple Music? There’s no shortage of choice if you want to jump from one streaming music service to another, but don’t be too hasty. Before you switch sides you want to make sure you’re not going to lose any of your precious tunes along the way. Here’s what to look out for along the way. To do this properly, ideally you want to have your old streaming service and the new one running alongside each other for a month or two. Either make use of any free trial offers you can find, or scrimp together enough cash to keep two subscriptions running in parallel. This gives you the chance to compare playlists side-by-side in the two apps and make sure nothing’s missing, and it’s probably worth the extra $10 or so for the peace of mind. It should also flag up exclusives in the different catalogs that you need to know about. Of course, if some songs are available on one platform and not another, then even the best switching service in the world can’t help you out. If you spot discrepancies, then your only real option is to buy the tracks as downloads and import them (of which more shortly). Most streaming services quote a catalog size of around 30 million tracks, but which 30 million is another matter—no one’s yet gone through album-by-album to make a comprehensive list of which artists appear on which streaming platform. We’ve certainly noticed occasional differences in the past, but whether you will depends on your musical taste. Again, having both services running together, if only for a month, should help you to identify any gaping holes that you need to be aware of. Transferring playlists is actually easier than you might think, thanks to the excellent Soundiiz. It works with the likes of Spotify, iTunes, Deezer, Groove Music and even YouTube and SoundCloud—simply log into each service and move the playlists across. Soundiiz isn’t the only game in town: Stamp (for Mac, Windows and iOS) will do a similar job, though you really need to pay for a premium account to use it properly, while Move To Apple Music focuses specifically on getting playlists from Spotify into Apple Music. Obviously if you have the time and inclination you can copy over all your playlists manually, track-by-track, with both apps open. It’s going to take you a long time, but at least you have the opportunity of cutting out tracks you’re not so keen on any more. If you don’t really use playlists, instead relying on whatever ‘collection’ or ‘library’ feature your service of choice uses, the process becomes much more long-winded. You might want to set up playlists for each of your artists and transfer tracks that way. If you’ve got a lot of local files in your collection then the task starts getting a bit messier. As mentioned above, if your destination service doesn’t have these tunes in its catalog, then you’re going to need to import them as local files—that is, if you’re able to. The feature’s supported on Spotify, Google Play Music, Apple Music and Deezer, but not Tidal. And of course, we’re assuming you’ve still got access to these local MP3 tracks and haven’t erased them to signal your full commitment to our cloud computing future. 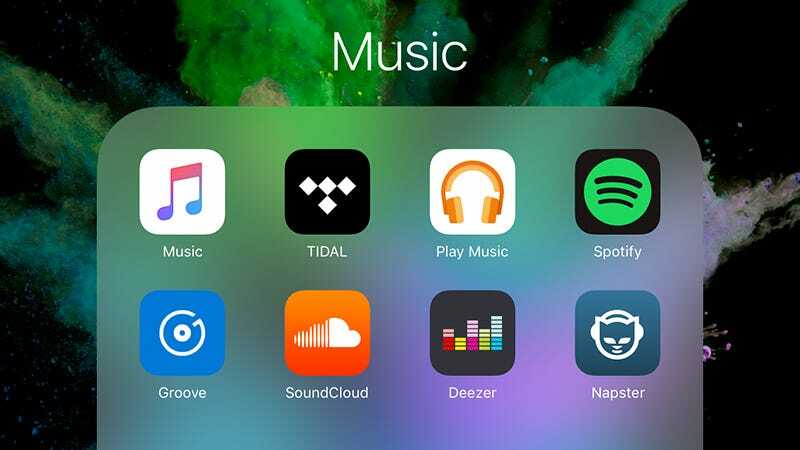 Both Apple and Google let you buy music to download from their respective online stores, and there other options like 7digital and Amazon if you want to shop around for the best price. In general, you’ll find fewer exclusives than when you’re just streaming tracks. While It may be a long time since you bought a digital music track if you’re a streaming music subscriber, the more music you actually own, the less exclusive deals and gaps in each catalog library are going to affect you as you jump between services. But then again, the whole point of streaming is to get access to all the music you want without paying for individual tracks and albums, so there’s a balance to be struck—just don’t forget your rare MP3 downloads as you switch from one platform to another.